Capt Tim Richardson is the consummate professional boat captain. Being based in Florida since 1992, and traveling worldwide, Capt Tim has fished in so many places, with different techniques and styles of fishing to produce a well-rounded and highly respected fisherman. Capt Tim has fished the Cairns black marlin season on the Great Barrier Reef since 1989. and has been the Captain of his boat, the “TRADITION” since 2005. He as been based in the Dominican Republic for the last several years in the Cairns off season, which is also the prime season for DR, first on the Ambush, for a couple of years, then leased the Prime Time in 2015, and fished his new boat, the 48' G&S "CHASER" which he has lovingly restored over the last few years. He has fished in Australia, Florida, Bahamas, Turks and Caicos, Montauk, Bermuda, Panama, Costa Rica, St Thomas, Puerto Rico, Dominican Republic, British Virgin Islands and Caribbean, St Martin, Montserrat ,Dominica,Martinique, St Lucia, St Vincent and the Genadines, Barbados , Mexico, both Pacific and Atlantic, Hawaii, and of course the greatest place on earth – the Cairns and Lizard Island region of the Great Barrier Reef. 2013 Cairns Season 13 over 650 lbs and 3 over 1000 lbs. 2012 Cairns season with lots of big fish and the largest fish of the season 1220 lbs. 2011 Cairns season with 3 over 950, including the biggest fish of the season at 1103 lbs. 2010 Cairns season with 3 over 1000 lbs released and another 3 over 900 lbs released. 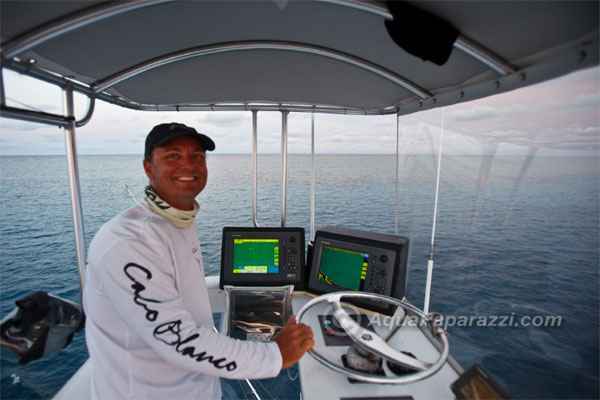 1st Place 2008 Barcadi Billfish Tournament as Captain of the Certifiable, numerous tournament wins as a mate and captain. Tims other passions are motorcyle racing, spearfishing, golf, and his lifelong love of surfing. Captain Tim Richardson is available worldwide for freelance captain work, boat design and construction oversight. Fly fishing for marlin, light tackle or unlimited heavy tackle, and record fishing are all loves of Capt Tim.